Lightweight Polyester Fabric with Pleat Effect. Colour may not be exact as photos are affected by different light conditions and computer settings. Size XL 24-26. COUNTRY CASUALS. PRETTY SHORT SLEEVE JUMPER. Country Casuals Petite Cardigan. Flattering stripe design, see photo's. Round neck 7 button fastening. Women's COUNTRY CASUALS Yellow Grey Black Fine Knit Top. Size Xl Plus Size. Fine knit top in striking grey black yellow and white colourway. Very good condition. 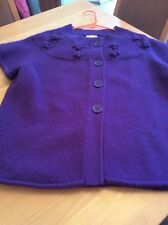 Cardigan is in excellent condition, cotton/polyester mix. Has a chunky heavy feel to it. No buttons. Lovely knit design pattern throughout. Size 16. Country Casuals Red Cardigan with black beading Size 10/12. Lots of clothes and shoes. 71% viscose 29% nylon. 10 maybe 12. Black beading down front and around neckline. Country Casuals cardigan size M. Smart/casual/office/work. Pit to Pit = 45 cm. Material -pure new wool. Green - shades of green around edge. Shoulder to Hem = 54 cm. Ladies Pink Cardigan By Country Casuals , Medium..Collar Is Removable. A gorgeous red and white striped jumper with 3/4 sleeves by Country Casuals. Only worn twice. It was a bit big when I bought it and wish I had got the small as it is a lovely design. Country Casuals Top. Nice neck detail. Short sleeves. 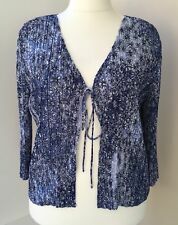 Stylish Country Casuals waterfall cardigan in a lovely shade of blue. Size small. Country Casuals nautical-style stripe cardigan. Super smart nautical style stripe cardigan with elegant waterfall front shaping. Cardigan has shaped fronts that fall into centre front points with a slight hi-lo hemline. Condition is Used. Length 22. 5 in s. Inside sleeve 11. 5 in s. Armpit to armpit 20 in s.
We love this! The perfect addition to any wardrobe! Country Casuals - - Grey/Blue/Beige Long Striped Cardigan - - S Petite. Condition is Used. Dispatched with Royal Mail 2nd Class. Country Casual pink angora shrug with diamante clasp at front. Size Large Petite. Small hole in the back stitched. Hardly visible. I have other items listed and am always happy to combine postage wherever possible. Please visit my shop to see my other items. New items are added each week - please add me to your favourite selllers and do ask if you are looking for something in particular. Please note that any jewellery shown with clothing is for display purposes only and is not for sale. Payment by PayPal only please, within 3 days of listing ending. Please do not bid if you do not intend to pay. Please do ask if you have any questions or require any further information and I will endeavour to answer as quickly as possible. Thanks for looking - happy bidding!. Here I have a pretty short sleeved jumper from CC. it is from their petite range, so is particularly suitable for women of 5’ 3” and under. CC call the jumper multi coloured. In fact it has stripes in various shades of green, plus white. It has a nice scooped neckline and the material has a good drape. It measures approximately 19” armpit to armpit and 22.5” back neck to hem. It is brand new with its original tag, showing a price of £59.90. I will however start the bidding at a fraction of that. We are a non smoking, pet free household. I will send by Royal Mail second class signed for delivery. PayPal and UK bidders only please. VINTAGE DEEP OLIVE WOOL BLEND SHOULDER EMBROIDERED CARDI/COAT B 38"
UNIQUE CLASSIC LONG CARDIGAN/ COAT - EMBROIDERED SLEEVE. LOVELY BRIGHT EMBROIDERED SHOULDER - THREAD TRIM DOWN FRONT. great look over trousers and withclassic shirt - equally good over a dress or skirt. Lovely for the evening or could be used for smart wear. Overall length 21". Its in good condition as lightly worn. Has one popper at neckline to do up. Lovely ribbon and beadng detail on left-hand side around the neckline. Up for grabs is this lovely Pink Cardigan from Country Casuals. CC Cotton Cardigan Size Large. Condition is Used. Lovely heavyweight hip length cardigan in a slub cotton. Arran detail to front and back. Would fit size 18 Dispatched with Royal Mail 2nd Class. Made in Italy. Batwing Sleeves. Lagenlook Style. Condition is Excellent. Gorgeous blue mix long sleeved cardigan with knitted striped top insert. • in excellent condition. • Please see my other listings. • From a smoke and pet free home. Ladies Country Casuals Chocolate Brown Viscose Jumper Size Large. Dispatched with Royal Mail 2nd Class. One bead missing but extras in envelope. Chocolate brown with beading and sequins around neckline. 3/4 length sleeves. Cool viscose knit. Ladies Country Casuals Knitted Jumper, Size M, Blue, Warm Winter Work Jumper. Beautiful thick knitted jumper. Lovely and warm for the winter months ahead. In immaculate condition. Perfect for any occasion. From a smoke and pet free home. LADIES JUMPER WHITE SIZE L .COUNTRY CASUAL SHORT SLEEVE. Condition is Used. Dispatched with Royal Mail 2nd Class. Lovelys ma rt jumper wi th detachable co ll ar. I n go od condition and shape. Although it's size Small, Country Casuals sizes are generous. I'm normally 10. Item from a smoke free house. but in good condition. 13% Angora, 43%viscose & 44% Nylon. Sleeves 23". Underarm to underarm circumfrence 40". Back Length 20". COUNTRY CASUALS M JUMPER BROWN AND WITH RUST ORANGE TRIM PATTERN VERY STUNNING WOULD SAY MORE A PETITE 10 THAN M. IN EXCELLENT CONDITION.